Discussion in 'Puritan Literature' started by FenderPriest, Jul 10, 2008. This would appear to be the third thread with this tittle on the board, so if the moderators would prefer it joined with the others, I take no offense - they are, however, locked, and not what I was looking for. Anyhow, I've been reading the letters of John Bradford recently, and have been deeply met by his wisdom in them. So I'm thinking that after I read his letters, I may move buy and read Rutherford's letters. So I was wondering, has anybody hear read them? Any thoughts or reflections on his letters? Spurgeon praised them as “the nearest thing to inspiration which can be found in all the writings of mere men.” I figured that was good enough recommendation to buy the book, but I was interested in yous guy's thoughts. Thanks! Spurgeon's sentiment is obviously hyperbole, but the Letters are definitely amongst the classics of Christian literature. 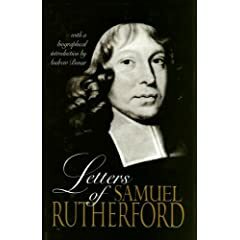 Rutherford hits a high note in expressing love for Christ which many men find difficult, and it is probably for that reason that his Letters have been so highly prized. His concern for the church as Christ's bride is most admirable; and his comments on suffering in the Christian life seem to be heaven sent messengers to cheer the burdened spirit. Bonar's edition is the best. His collection contains 365 letters-one for every day of the year. It also contains a biographical sketch and footnotes of his recipients. Sometimes I would use the Valleyof Vision and other times I would read one of Rutherford's letters at devotional times. He has a very high and lovely view of Christ and contains many pithy sayings. If I am leading communion in our church I would often look for a quote from Rutherford. During his ministry and subsequent exile it is quite apparent to Rutherford that Christ was the source of all strength, joy, hope, comfort and the deep experience of Christ he enjoyed. Bonar's edition is by the Banner of Truth but is I think being reprinted having been out of print for a while.There is a small volume, the Loveliness of Christ which is a collection of quotes from his letters but for all it is its quite expensive. Your better with the complete letters and gather up your own collection of quotes from him. -Christ is the sinners magna carter. -I know not a thing worth buying but heaven; and my own mind is, if comparisonwere made betwixt Christ and heaven, I would sell heaven with my blessing and buy Christ. -the weightiest end of the cross of Christ that is laid upon you lieth upon your strong Saviour's shoulder. -when I am in the cellar of affliction I look for the Lord's choicest wines. -I have benefitted greatly by praying for others; for by making an errand to God for them, I have gotten something for myself. -if we were not strangers here, the dogs of this world would not bark at us. To me thou still art dear! I drop for thee a tear. I have read some  of his Letters, as published by Banner of Truth, in the "PURITAN PAPERBACKS" series. His letters are very instructive. One letter I found particularly interesting, and helpful is on page 70-73 of the puritan paperback version. A letter John Fleming: Directions for Christian Conduct. And on pages 81-82 is a letter to David Dickson on Christ's Infinite Fulness. Some day I shall purchase the Bonar edition and read the 300 or so that the puritan paperback series didn't include. Rev. Winzer is quite right. The love of Christ, the longing for the Jews to return to their Messiah, the counsel to look to him when one finds oneself in the "furnace" or "wine-cellar" of "affliction," the wisdom of such sayings as "grace groweth best in winter,"...all of these and more permeate what is one of the great classics of Christian literature (although, ironically, Rutherford did not intend their publication). Kelly Kapic and Randall Gleason provide a good introduction to the Letters in The Devoted Life: An Invitation to the Puritan Classics. ...and now I do. Thanks Reformation Heritage Books!!! Thanks for posting this. I have picked my copy up again to read it devotionally. What an edifying book. Just got my copy today!